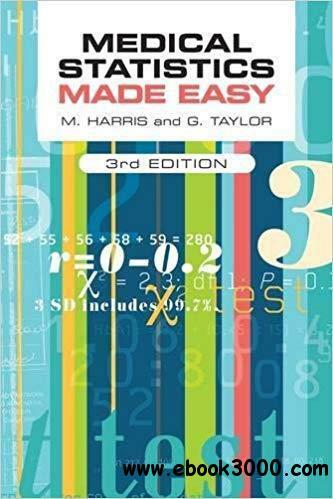 Medical StatisticsMade Easy 3e scores 99/100 and 5 stars on Doody's (Sept 2014)! Here's what the reviewer said: "This is a practical guide to the use of statistics in medical literature and their application in clinical practice. The numerous examples help make the conceptualization of complex ideas easy. It is a great resource for healthcare students and clinicians in the field." Medical Statistics Made Easy has been a perennial bestseller since it was first published in 2003 (#1 bestseller in medical statistics on Amazon). It is widely recommend on a variety of courses and programmes, from undergraduate medicine, through to professional medical qualifications. It is a book of key statistics principles for anyone studying or working in medicine and healthcare who needs a basic overview of the subject. Using a consistent format, the authors describe the most common statistical methods in turn and then rate them on how difficult they are to understand and how common they are. The worked examples that demonstrate the statistical method in action have been updated to include current articles from the medical literature and now feature a much wider range of medical journals. This new third edition continues with the same structure as the previous editions and also includes a new section on statistical process controls.